The blog is a place to let you all know about cool things we’re doing at Encyclopedia Virginia, so here’s one: Story Spheres. You may already be familiar with our virtual tours, which use Google StreetView technology to provide users access to the insides of historical sites. Story Spheres is similar but with the addition of ambient sound and audio annotations. Not only can you move through spaces via 360-degree panoramas, but you can hear what they sound like and hear people talking about what you see. 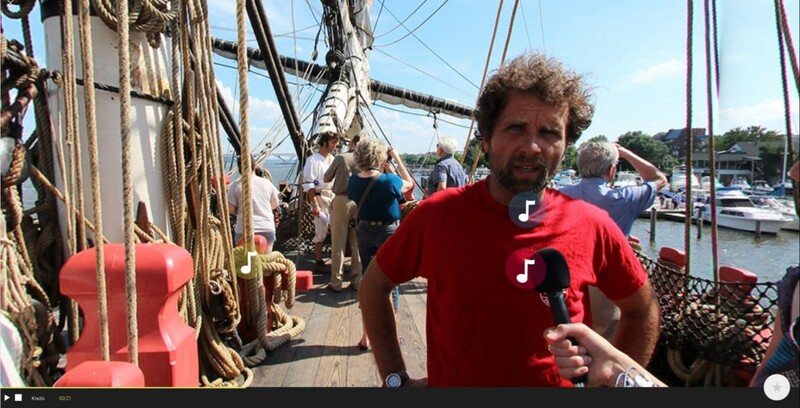 To test this out, we partnered up with our colleague Kelley Libby, a producer at the radio program With Good Reason, and traveled to Northern Virginia, where the Hermione was docked. A bit of background: The Hermione was the ship that famously brought the Marquis de Lafayette and his French troops to Yorktown in 1781. A replica has sailed the Atlantic again and we at EV were invited to photograph it. Kelley came along with her radio equipment and expertise so that we might add audio to the mix as well. Story Spheres seem to cry out for such collaboration and Kelley, in particular, is someone who’s really interested in thinking about different ways in which historical sites—either fixed or floating—might be interpreted. Anyway, you can see a screenshot of the results above; explore the gun deck here and the sailmaker here. To interact with the Story Sphere click and drag your mouse to explore the full 360-degree experience. To listen to the audio annotations, click the musical note buttons. Not to overwhelm you with my eloquence, but it’s cool! While we don’t know exactly how we’ll use this, we imagine that this could be a model for making encyclopedia content accessible to readers and fun and useful for teachers. And such a platform could be used for classroom projects. Students could learn about a place by creating their own Story Spheres, for instance. We’ll keep you up to date on how this tool develops. And thanks to Kelley for helping make this project possible.